The Susquehanna River is the longest river on the American east coast that drains into the Atlantic Ocean, and with its watershed it is the 16th largest river in the United States, and the longest river in the continental United States without commercial boat traffic. The Susquehanna River has long since been associated with boating due to the many migratory fish that are caught there. Many tourists and locals of Pennsylvania use the Susquehanna in the summer for recreation purposes such as kayaking, canoeing, and motor-boating. Once spelled "Sasquesahanough" on the 1612 John Smith map. Local legend claims that the name of the river comes from an Indian phrase meaning "mile wide, foot deep," referring to the Susquehanna's unusual dimensions, but the word is actually Algonquian, and simply means "muddy current." Today, there are over two hundred bridges crossing the Susquehanna. The sole remaining ferry, at Millersburg, Pennsylvania, is a seasonal tourist attraction. The canals are gone or are part of historical parks, and dams are related to power generation or recreation. Perhaps the most famous of the bridges, the Rockville Bridge, crosses the river from Harrisburg, Pennsylvania, to Marysville, Pennsylvania. The Rockville Bridge, when constructed, was the longest stone masonry arch bridge in the world. 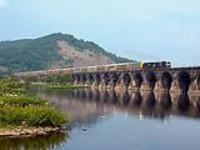 It was built by the Pennsylvania Railroad in the early 1900s, replacing an earlier iron bridge.